The gorgeous exterior of this home, coupled with its unique design, will create a memorable experience for all who see it. A large covered porch welcomes you and your guests inside where the great room will set the perfect mood for all occasions. A fireplace and French doors to the rear grilling porch help to enhance the great room. An island and a high bar with seating are just a few of the luxuries you?ll discover in this kitchen, just a few short steps away from the breakfast and dining rooms. Upstairs, one can?t help but admire the stunning view from the theater balcony before traveling into the media room or one of the remaining bedrooms. Two attic access doors also lend more than enough storage possibilities. Question: Hello, can you tell me the square footage and dimensions of the Master Walk in Closet and all other bedroom walk ins. I would greatly appreciate it. Thank you so much. Question: Is the ceiling in the attic storage space next to Opt. BR #4 (over the master bath area) high enough to accommodate a small (5X8or9) bath for that BR? It seems to indicate an 8' ceiling. Answer: We are working to obtain more photos of our designs however it’s really a challenge as we don’t want to be a pest but We need great pictures to show online. 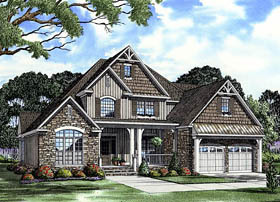 this is a best-selling design and absolutely gorgeous built! These are split foyer plans, but if customer wants a different house plan but wants garages placed in the basement, then we can modify to meet customer’s request. Question: What specifically is included with the CAD files? Could I receive a sample cad file (just maybe one page) that my architect could use to make the file works in his autocad program? Answer: Thank you for your interest in our home design. We are able to provide DWG and DXF file formats compatible with 2006 AutoCAD and earlier versions. The CAD file contains what our standard stock plan includes floor plan(s), foundation, exterior elevations, roof plan, cabinet elevations, electrical plan and specifications, legends and the 2006 IRC overview page.